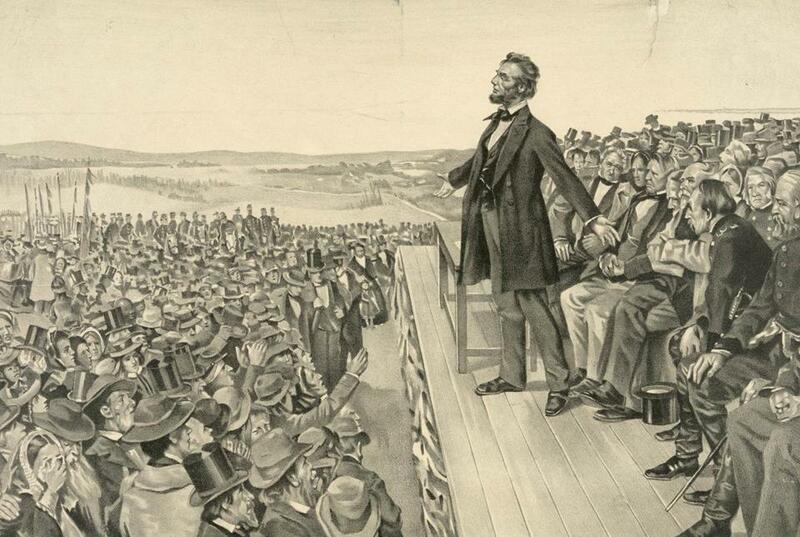 Abraham Lincoln speaking at the dedication of the Gettysburg National Cemetery on Nov. 19, 1863. With his latest tweets extolling himself for “being, like, really smart” and a “very stable genius,” President Trump treads all-too-familiar ground. His long record as a braggart is well known; the new examples change nothing. Those who find the president’s narcissism refreshing or appealing will go on doing so. Those who find it cringe-inducing now have fresh reason to be appalled. I’m in the latter camp, and not only when it comes to Trump. One of the things I hate most about politicians is the egotism in which so many of them marinate. It takes considerable hubris to deem yourself fit to govern others, all the more so when you don’t just harbor that feeling privately, but invest time, effort, and money into proclaiming your wonderfulness to anyone who will listen. George Washington copied by hand 110 “rules of civility” that he strove to uphold all his life. One of those rules was that “a man ought not to value himself of his achievements, or rare qualities of wit; much less of his riches, virtue, or kindred” — ought not, that is, to brag of his accomplishments or wealth or ability. He slapped water on his face, and water slopped out of the sink. He got some paper towels and got down on the floor to clean it up. An aide came in and said, ‘Mr. President, what are you doing? We have people for that.’ And Reagan said oh, no, he was just cleaning up his mess, he didn’t want a nurse to have to do it. Of course there is no guarantee that presidents who behave with humility will achieve greatness. But this you can take to the bank: Presidents who can’t stop bragging about how great they are will assuredly never be great. In China, as in all totalitarian-ruled countries, citizens are urged to inform on each other. Communist governments have from the outset deployed secret police to punish dissent, and the secret police have always cultivated networks of snitches. Regimes that claim an absolute monopoly on truth cannot abide independent thought or grassroots criticism. In the interests of exterminating heterodoxy, the totalitarians balk at nothing. In 2017, that includes the use of digital technology to make informing easier than ever. The . . . app enables users to notify authorities of problems ranging from leaky drains and domestic disputes to traffic violations and illegal publications, in text or photographic form, as long as the informants reveal their location and identity. In exchange, they get perks including discounts at upmarket coffee shops and coupons for taxi-hailing and music-streaming services. . . .
China already is building one of the world’s most sophisticated systems for monitoring its citizens covertly using facial-recognition cameras, customer data from big technology companies and a nascent “social credit” system that rates online and real world behavior. The party leadership now wants citizens to volunteer information that would allow the state to monitor them even more closely, discourage them from protesting or petitioning, and create vast pools of data on public grievances and local officials’ performance. Apps like “Safe Zhejiang” are being rolled out in many cities and provinces, with plans to integrate and cross-reference the information obtained with other data sets and video-surveillance footage, according to people involved in the apps. . . .
One notice on Zhejiang’s Tongxiang city government website said users should report on marital and other disputes, and on people who could “affect social stability,” including members of the banned Falun Gong spiritual movement, elderly petitioners, drug addicts and the mentally ill. But the Party has run into a problem. The peasants aren’t cooperating. Resistance so far has been stiff, principally from citizens who resent being forced to use a surveillance tool, or fear official retribution for voicing their concerns. For some, it smacks of the Mao era, when the party gathered detailed files on citizens and incentivized them to inform on each other. . .
Chinese people generally appear less concerned about data privacy than most Westerners. The lukewarm reception to the apps, however, suggests there are limits to how far they will willingly submit to China’s expanding surveillance state, and that many aren’t prepared to volunteer information to the government. In democratic societies, widespread active rejection of a government policy typically forces authorities to retreat. Sometimes that happens under the pressure of public opposition itself. Sometimes it happens because the party out of power exploits the dissatisfaction to challenge the government in elections. But that isn’t how totalitarian societies work. As the Journal’s reporters, Jeremy Page and Eva Dou, point out, the alternative to voluntary cooperation with the Communist Party’s surveillance regime is apt to be coercion. Beijing . . . wants to preserve party rule with the help of technology that allows it to keep closer tabs on citizens, while also appearing responsive to their needs. If experiments such as the apps fail, the party might rely more on the kind of intrusive surveillance technology it has pioneered in its Muslim northwest, where residents run a gantlet of checkpoints, cameras, and scanners checking ID cards, faces, and eyeballs. There are no such debates in Communist countries, where the first and highest function of technology is to strengthen those in power. Eugene Chow, exploring “The Dark Side of China’s Tech Boom” in The Diplomat last August, described how China has turned the nation’s ubiquitous smartphones into tools of “unprecedented control” over its citizens. “Thanks to China’s Internet giants – Baidu, Tencent, and Alibaba – the authoritarian regime now has the means to monitor a user’s every action, purchase, thought, and location in real time,” he noted. Pressuring people to use those smartphones to report on their neighbors and co-workers is a logical next step. The reports of “stiff” resistance are heartening, but China’s government has faced public resistance in the past. Its response has usually been to crack down with redoubled severity. And crackdowns are facilitated by informers. One of Mao’s intentions in the Cultural Revolution was to set the young against the old. In a country where tradition venerated the elderly, their hold on society needed to be broken. . . . Red Guards, sometimes as young as 12 or 13, were encouraged to report on their parents or grandparents. At times older members of the family were captured as a result of such denunciation, beaten, or sent away to labor camps. One family . . . saw both the father and the grandfather taken by Red Guards after they had been reported on by the youngest son. The boy, 14 at the time, participated in their public humiliation and torture. The grandfather died as a result. The pattern was repeated a million times over across China. The methods used by the Chinese Communist Party under Xi Jinping may not be as publicly savage as they were under Mao. But of their savagery there is no question — from torture and the repression of minorities to the “disappearing” of human rights defenders and forcible extraction of vital organs from peaceful Falun Dafa practitioners. Beyond the skyscrapers and the consumer electronics, China remains a land under tyranny, whose rulers demand obedience from their 1.3 billion subjects. Optimists once believed that information technology would make liberty unstoppable and Communist regimes unsustainable. But fax machines didn’t keep the tanks out of Tiananmen Square. The Internet didn’t rescue Nobel laureate Liu Xiaobo from death in a Chinese dungeon. And it will take a lot more than disabling the government’s new snitching app to end Beijing’s malevolent surveillance of China’s men, women, and children. Politicians like to call themselves “public servants,” but my usual impression is that they are considerably more interested in serving themselves. Admittedly, my cynicism may have something to do with the fact that I live in Massachusetts, where news stories about elected officials frequently include such terms as “arrested,” “indicted,” or “convicted.” Back around the time I started following Massachusetts politics, a New York Times story reported that “corruption in state and local government in Massachusetts” had become “a way of life,’’ so much so “that bribery, extortion, tax evasion, illegal campaign contributions, and the laundering of money to disguise its origins were commonplace.” That made an impression. The death of Robert Q. Crane on Friday recalled a classic example of the sleazy political culture that Massachusetts all but takes for granted. Crane held public office for 35 years, 26 of them as state treasurer. “Through it all,” as the Globe observed in its obituary, “Crane retained an unwavering devotion to the fine art of political patronage. . . . As relatives and friends of state officials and legislators found their way onto the payroll, he resolutely dismissed any suggestion that patronage” be curtailed. Crane indulged for decades in what Tammany Hall boss George Washington Plunkitt called “honest graft,” using his office and its powers to benefit himself and enrich his friends. But they’re not all bums! Some officeholders, even in Massachusetts, really do go into politics because they are committed to serving the public. And if I don’t hesitate to scorn the bad apples, I figure I should be just as diligent about applauding the good guys. So let me now praise Donald R. Berthiaume Jr., a state representative from Spencer, Mass., who spends snowy winter days getting the driveways and front walks of constituents cleared of snow. I don’t mean he calls Town Hall to demand that the Public Works Department to send a crew out to do it. I mean he plows and shovels them out himself. [W]ith the defroster blasting, a heated leather seat under him, and a coffee in hand, he drove off to the home of Robert and Carol McPherson and dropped his plow. He said he saw their daughter, Beth, clearing snow from the ramp in her wheelchair and thought she shouldn’t have to do that, even if she wanted to, so he grabbed a shovel and cleared a path. . .
For a legislator a snow day might mean staying home, watching a movie with the kids, or catching up on paperwork, but even before he held the seat in the House of Representatives, the Spencer Republican was plowing driveways, making repairs to homes where veterans or senior citizens live or laboring on a project for the town. Headed south on Route 31 a car was stopped in the street as a small group tried to clear a mound of snow that was blocking a driveway. Without a thought, Mr. Berthiaume swung across the street and pushed back the snow with a few swipes of the plow blade. He waved and drove off as the shovelers waved back with confused looks and smiles on their faces. Mr. Berthiaume plowed out another driveway where a woman lives alone after losing her daughter. “She’d take you in off the street,” he said, maneuvering the truck to push the snow back far enough to leave room for the next storm’s accumulation. I’ve never met Berthiaume. But Ring, who has covered Worcester-area politics for years, tells me in an email that the state legislator is a genuine “tell-it-like-it-is country boy who hates red tape and wants to find easier solutions to things.” Often, the easiest solution he can find to a problem is to take care of it himself. The sidewalks on the Park Street Bridge in West Roxbury haven’t been cleared since last Tuesday’s blizzard, and even more snow has fallen after that. So state Rep. Ed Coppinger of Boston decided to take matters into his own hands. “I received calls saying it was unsafe. I drove by and witnessed it was unsafe,” Coppinger said. He decided to start shoveling the snow himself. Yes, I know: Legislators aren’t elected to clear snow. But give me a snow-shoveling politician any day over one who thinks the solution to most problems is to pass a law, or spend public money, or issue a press release. Lawmakers whose idea of public service is to pull on their boots and fix what needs fixing are the kind of lawmakers who — if only there were more of them — could neutralize the cynicism with which many of us regard politics. Are there more of them? The floor is open for nominations: Do you know of elected officials whose idea of public service is to roll up their sleeves and personally make things better? If so, I’d like to hear about them. Send me the details, and I’ll share them with Arguable’s readers. My Sunday column — the first of 2018 — stemmed from a recent visit to Taiwan, which convinced me that Taiwan not only isn’t a part of China in the political sense, it isn’t a part of China in the national sense, either. A majority of Taiwan’s residents once considered themselves to belong to the Chinese nation. Today, after 30 years of democracy, the national identity of most of Taiwan’s population is exclusively Taiwanese. There is no longer “One China” on the two sides of the Taiwan Strait. There is one China and one Taiwan, and the world should stop pretending that isn’t the case. My last column of 2017 threw cold water on the oft-repeated claim that Republicans in states like Alabama engage in “voter suppression” to keep blacks from casting ballots. Actually, the ones dousing that claim with cold water were Alabama’s black voters, who turned out for last month’s special Senate election at such a high rate that it surpassed their percentage of the population. Requiring voters to show an ID when they vote may or may not be a useful policy, but it certainly doesn’t keep motivated minorities from voting. That, too, is something we should stop pretending isn’t the case. In Scotland, every clan has its tartan. Including the Jews. Amazing images of baby animals in the womb. Two dozen stunning European libraries. From caterpillar to butterfly in three minutes.